The captions for the five line drawings are on page 20. For more Anzac Day activity sheets from ForTeachersForStudents go to Lessons and activity sheets then click on the "Activity sheets" link on the right of the page. Acknowledgment: image taken from the old North Beach Primary School website. Anzac soldier to colour in. 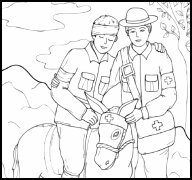 To download the pdf file click on "ANZAC soldier colouring in page". This counting activity sheet could be used as a colouring-in activity. Poppy colouring-in pages from Samoa. Samoa also uses the poppy as a symbol of remembrance. Note that Anzac Day is "commemorated" rather than "celebrated". Move the mouse over the image at that site and click "Print" (an advert may display before the print page appears). To download the pdf file click on the link "Rosemary colouring page". If you need suggested colours, see the ActivityVillage Rosemary poster. A detailed "doodle" design using background images of poppies and rosemary to highlight the word "Remember". Similar to the colour-in drawings designed as stress-relievers for adults. To download the pdf file click on the link "remember_dooodle_colouring_page.pdf". ● An alternative version is available in which the background is already coloured in. Illustration of John Simpson Kirkpatrick, his donkey and an injured soldier, promoting the book Simpson and his Donkey, written by Mark Greenwood and illustrated by Frané Lessac. A pdf one-page worksheet to dopwnload. Note that ForTeachersForStudents provide a wide range of other basic worksheets on Anzac Day. Go to Lessons and activity sheets and click on their "Activity sheets" link on the right of the page. A British portrayal of Simpson and his donkey with a wounded soldier. Click on the link to the pdf file. From Frané Lessac, the illustrator of the book Simpson and his Donkey which is written by Mark Greenwood. ● For more information about John Simpson Kirkpatrick and his donkey, see our Simpson and his Donkey page. Click on image for pdf file. One of several Australian flag printables. Provides a blank flag [pdf] and a flag with key [pdf]. Flag is displayed vertically on the pdf file to maximise printing size. You can download the image as pdf file. One of several New Zealand flag printables. Click on flag for page to print and colour in. ● See also our Anzac art page.